Record and protect information in this hard cover account book. Note: A minimum quantity of 33 must be ordered, and in units of 3 thereafter. 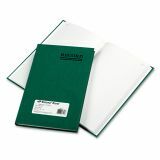 National Emerald Series Account Book, Green Cover, 200 Pages, 9 5/8 x 6 1/4 - Record book features a green hard cover and white paper acid-free, archival-safe paper. Pages are numbered for easy reference. Record book contains 100 percent recycled material with 30 percent post-consumer material.